During the 1970s and 1980s, much of the world was in a liberal cycle with ever more countries being democratic and free; but now, it is in an illiberal one with ever more countries become less democratic and less free, according to Yevgeniya Albats, the editor of The New Times. And when the world and individual countries are in an illiberal cycle, she continues, “it becomes fashionable to be an autocrat,” and unfortunately, “autocrats all are beginning to take the very worst habits from one another.” And equally unfortunately, “society lacks the forces to oppose them” (echo.msk.ru/programs/personalno/2177092-echo/). 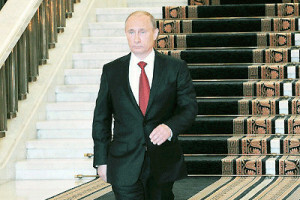 The situation in Russia, Albats says, is compounded by the extremely low quality of elites, a common problem for post-communist countries but far less in Eastern Europe than in the former Soviet space where communists were in power for far longer and inflicted more harm on those who have emerged as leaders. According to the American media, “the most incompetent president in the history of this country now sits in the White House,” a man “who has taken steps” that most people are horrified by and are talking about resistance rather than opposition, Albats suggests. All this indicates that at least for a time, things are going to get worse. At the same time, she insists, she doesn’t think that “the regime in Russia is evolving toward totalitarianism. It could become harsher,” especially if oil prices fall. But it won’t become totalitarian because a totalitarian regime requires an ideology and a party around which people unite” as was the case in fascist Germany and the Soviet Union. Moreover, the editor says, “there are no economic causes” pushing Russia toward totalitarianism. There is no drive to industrialize, a common feature of most totalitarian systems. And there are even reasons to think that the Putin system will collapse long before it could reach that state. Many in the elite around Putin are suffering because of his policies, and at some point, some of them are likely to think about a palace coup especially if they see no end to their suffering unless the Kremlin leader is removed from the scene. But there is another reason to think that Putin won’t push things too far. Despite his image as a powerful individual, in fact, Albats says, he is currently compelled to paly by the rules of the game that he and others have set and he recognizes the threat he and his family would face if he presses things too far, even in this current illiberal cycle in Russian and world history.